SALALAH, Oman, May 27, 2018 (BSS/AFP) - The death toll from a cyclone that battered southern Oman and the Yemeni island of Socotra has reached 11, while eight sailors are still missing, authorities said. Cyclone Mekunu hit Oman's Dhofar and Al-Wusta provinces on Friday after intensifying from a category one to a category two cyclone, with winds of up to 170 kilometres (over 100 miles) per hour after it made landfall on Socotra on Thursday. Oman's civil defence service on Saturday reported two deaths, adding to an earlier toll of a man and a 12-year-old girl. "The third is an Asian man who was missing but his body was found late Saturday in Dhofar" province, spokesman Lieutenant Colonel Saeed Al-Badaei said at a press conference late Saturday. 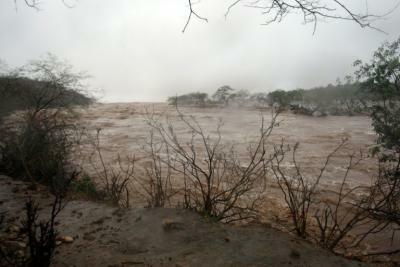 "The fourth is a young Omani man who was swept away in his car by flooding," he added. Socotra's governor Ramzy Mahrous said on Sunday that the death toll on the island remained seven -- five Yemenis and two Indian sailors. A further eight Indian sailors remain missing. The southeastern part of the island remains cut off, but authorities are working to access the area and assess damage, Mahrous told AFP. Around 1,000 families on Socotra, with a population of around 60,000, were evacuated after their homes were damaged. The main road linking the airport to Hadibo, the island's main city, has been reopened, Mahrous said. Oman's meteorology directorate announced late Saturday that "the direct effects of the tropical system are over." Cyclone Mekunu has now been downgraded to the category of "deep depression". Late Saturday it struck Saudi Arabia's Empty Quarter, one of the world's most arid deserts, with ongoing heavy rains and strong winds. The Saudi meteorological authority said on Twitter Sunday that winds blew at 60 kilometres (over 35 miles) per hour, kicking up blinding dust storms. Rains are expected to continue for two more days, drenching the area with more than 100 millimetres (four inches) of rain, almost six times its annual average, Amman-based weather experts WASM said on Twitter.